Exclusive! Any outfit becomes a holiday outfit when you add the right socks! Be festive to the last detail in print polyester holiday trouser socks. Fun gifts, too. Machine wash. One size fits women's shoe size 4-12. 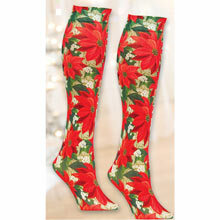 I am so glad to find the support hose come in cute Christmas designs. I love the feel and designs. I love wearing them to my caroling practice and will continue to wear them throughout the season. These seem to be fine, but they are not stretchy enough at the top to fit over my calf, it's 15 inches. Probably be good for anyone with a 10-13 inch calf.